The NACE Learning Platform provides learning opportunities addressing the topics most important to the field and to your organization. Facilitated by NACE members for NACE members, programming will provide innovative solutions to current challenges, leverage insights into future trends, and enhance your continuing education and professional skill set. Learn when you want, where you want, and how you want. Developed by NACE members for NACE members, NACE webinars focus on topics that are timely and relevant to the field. Purchase two or three on-demand webinars at a time and save. All webinars must be purchased in a single transaction. Discount will be automatically applied at checkout. Look for this symbol for annual pass-eligible products. Plan on viewing more than three on-demand webinars? Consider purchasing an annual pass. NACE Learning Platform annual passholders will have access to a full catalog of on-demand webinars, FREE how-to videos, toolbox content, and more for one full year. Purchase 5 -- 9 annual passes and save 5%. Purchase 10 or more annual passes and save 10%. All annual passes must be purchased in a single transaction. Discount will automatically be applied at checkout. Each annual pass must be assigned to a specific individual during checkout. The 30- and 60-hour NACE Coaching Certification programs were developed based on a blended learning model, which includes a combination of live and on-demand modules. The 30-hour and 60-hour certification webinar bundles below are available now with no time restrictions. Purchase a bundle now and proceed through the program at your own pace. 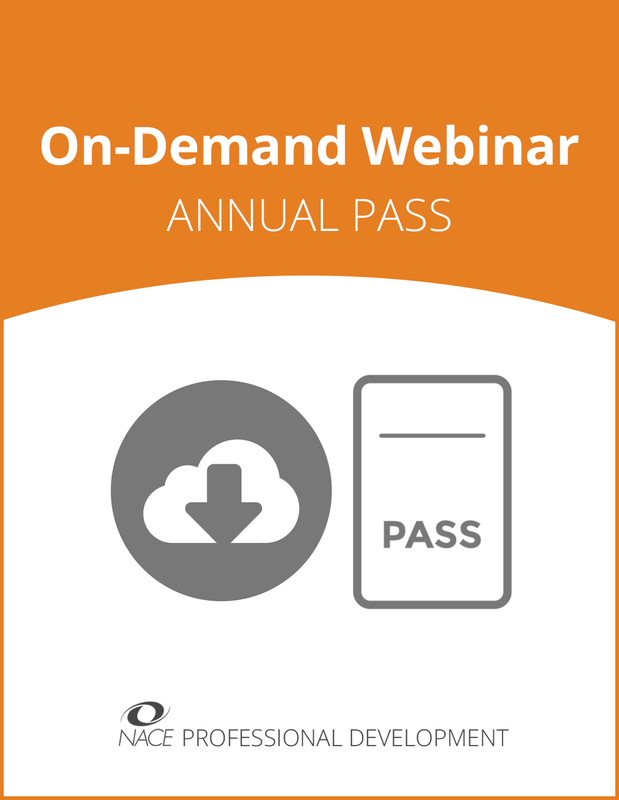 Note: NACE Coaching Certification webinar bundles are not included in the annual pass. NACE Professional Development has been working diligently with leaders in the field to develop robust, new learning experiences, including the Leadership Essentials and Wise Wandering System comprehensive courses. Join Katharine Brooks, executive director, career center, Vanderbilt University, and author of the best seller “You Majored in What? Designing Your Path from College to Career” to learn firsthand how research-based career counseling strategies within the Wise Wandering System can empower your client population as it navigates through career exploration. Based on positive psychology, appreciative inquiry, and chaos theory, along with nonlinear approaches, the Wise Wandering System equips clients with the strategies needed to process, define, and articulate career pathways through active reasoning and application as part of the creative process. Mitigate the barriers to career counseling process with storytelling. Asynchronous, virtual programming through the NACE Learning Platform. Note: NACE comprehensive courses are not included in the annual pass. Can you differentiate between management and leadership? Is your leadership approach rooted in an evidence-based model? Would you like to propel your leadership trajectory using practices of excellence from leaders in the field who have been where you are? Explore practical and actionable leadership strategies, and improve relationships with external and internal stakeholders to leverage your impact within your organization through examination of an evidence-based leadership model. Examine how skills gained are transferrable across a variety of industries while gaining insight from NACE URR Thought Leaders. Use leadership strategies to increase motivation and employee engagement. Is your office interested in expanding the services it offers? Are you challenged with doing more with less? Would you like to elevate your student staff’s skills and empower them to have a bigger impact? In this course, Mary T. Calhoon, associate director of the Career Studio at the University of Nevada, Reno, teaches you how to get started with peer-led career coaching at your institution. Examine the curriculum development process required to design a sound peer mentoring program, from ideation to execution, including steps for gaining buy-in from stakeholders. Use the curriculum development process to design a peer coaching program. Contact NACE Professional Development at events@naceweb.org, 610.625.1026.